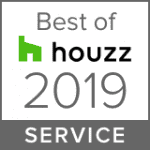 Georgetown, MA, January 24, 2019 – Curtis Cabinetry of Georgetown, MA has won “Best Of Customer Service on Houzz®, the leading platform for home renovation and design. The 30-year old Custom Cabinetry manufacturer was chosen by the more than 40 million monthly unique users that comprise the Houzz community from among more than 2.1 million active home building, remodeling and design industry professionals. The Best Of Houzz badge is awarded annually, in three categories: Design, Customer Service and Photography. Design awards honor professionals whose work was the most popular among the Houzz community. Customer Service honors are based on several factors, including a pro’s overall rating on Houzz and client reviews submitted in 2018. Curtis Cabinetry is an established, family-owned and operated kitchen cabinet business serving the North Shore, Merrimack Valley and Greater Boston areas since 1987. We specialize in custom kitchen cabinets, bathroom vanities, entertainment centers, home offices and mudrooms designed in Traditional, Contemporary, Transitional and Shaker styles. Our new kitchen and bath showroom allows our customers to experience first hand the quality and style of our cabinets in addition to the many innovative storage solutions displayed throughout the showroom.